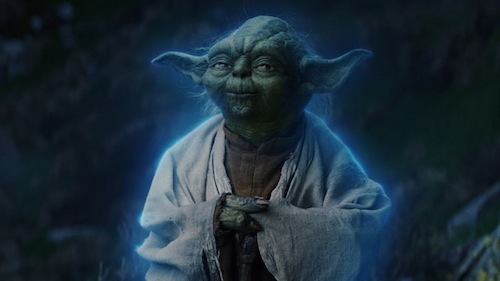 Master Yoda's surprise cameo as a Force ghost in Star Wars: The Last Jedi, a theory I postulated during Star Wars Celebration Europe, was a highlight of director Rian Johnson's sequel to The Force Awakens. Once again the mischievous and beloved Jedi Master was played by Frank Oz. The popularity of Yoda's cameo in The Last Jedi has spurred suggestions he'll return to aid Rey (Daisy Ridley) in the climactic conclusion of the sequel trilogy, Episode IX, directed by JJ Abrams. “The success of the scenes featuring Yoda in ‘The Last Jedi’ were huge,” says our insider. If all goes according to plan, the sci-fi space sage will rejoin the series in spirit to mentor a young warrior played by British actress Daisy Ridley, we’re told. Star Wars: Episode IX will be in cinemas December 2019.